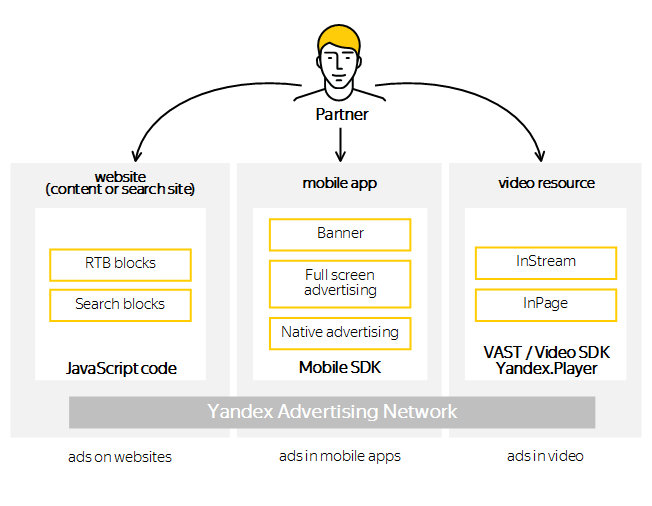 Yandex Advertising Network provides ad placement opportunities on websites, in mobile apps and in video content. Each element of this diagram is a link to its corresponding Help section. If you have a website that satisfies the Terms of Participation, you can submit an application to join the Yandex Advertising Network. The process is described in Submitting the application form. 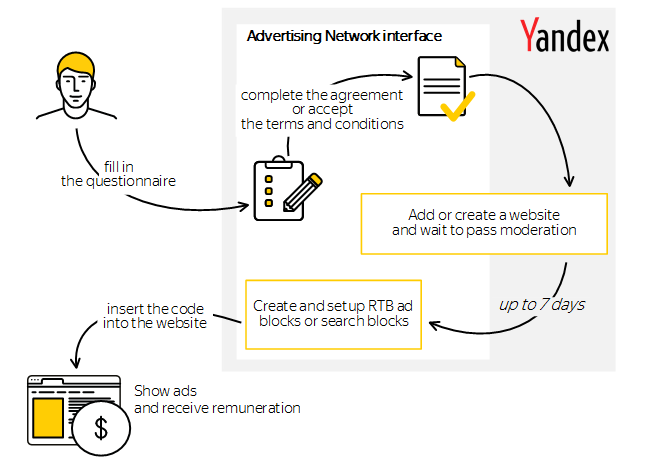 As soon as your store passes moderation, you can go to the Yandex Advertising Network interface to set up your ad platforms and create ad blocks. Available options for placing ads are described in Ads on websites. Your application will be reviewed within a week. After your site is checked, an email will be sent to the address that you specified during registration, and the platform status will change to Working. Can I send another request if my first request was rejected? If your application was rejected, we suggest that you develop your website and improve the quality of your audience. You will be able to re-submit your application to participate in the Yandex Advertising Network no earlier than a month after rejection. 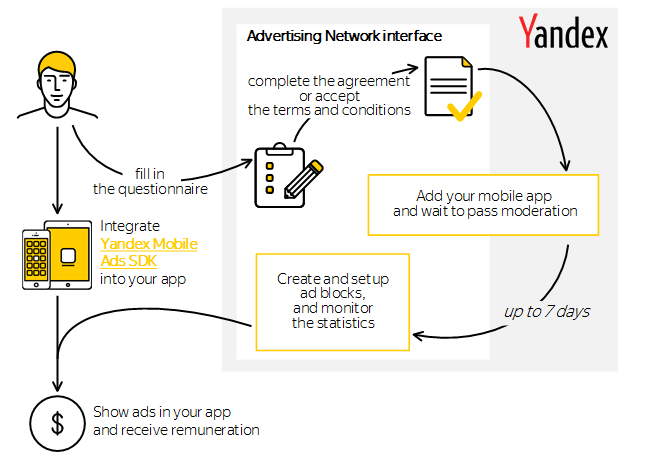 After you submit the application and finalize an agreement (or accept the terms and conditions), you will be able to go to the Yandex Advertising Network interface where you will need to add a mobile app. Enter the name, platform, and ID of your app in the App Store (How can I find my application's Bundle ID?). If you already have an account on the Yandex Advertising Network (for example, you advertise on your site), you do not need to submit the application a second time. You can immediately proceed to adding an app (Add mobile application link). Your application will be reviewed within a week. After the app is verified, an email will be sent to the address that you specified during registration, and the app status will change to Working. If your application was rejected, we suggest that you develop your app and improve the quality of your audience. You will be able to re-submit your application to participate in the Yandex Advertising Network no earlier than a month after rejection. Available options for placing ads are described in Advertising in mobile apps. At present, you can only obtain access to the Yandex Advertising Network video blocks if you have an invitation from a Yandex manager. 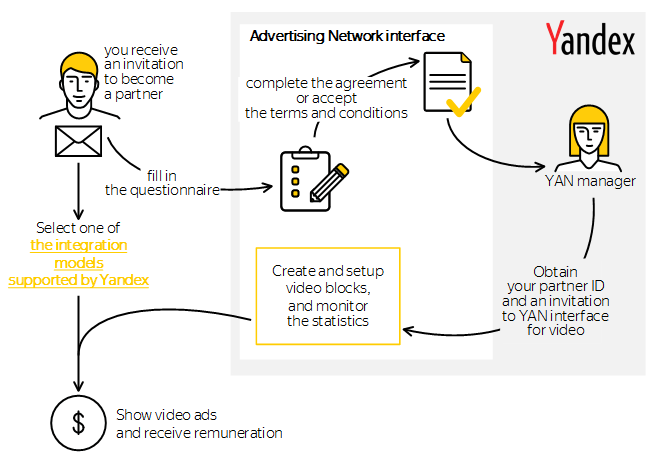 To join the Yandex Advertising Network, your video resources must contain licensed video content or your own original video content (not aggregated user content). After you submit the application and finalize an agreement (or accept the terms and conditions), you will receive a partner ID and an invitation to the Yandex Advertising Network interface, where you will need to add a video resource. If you already have an account on the Yandex Advertising Network (for example, you publish ads on your site), you do not need to submit the application a second time. When you receive the invitation, you will get access to the video interface, and you will be able to start creating and configuring video blocks. Your application will be reviewed within a week. After the video resource is checked, an email will be sent to the address that you specified during registration, and the video resource status will change to Working. If your application was rejected, we suggest that you develop your video resource and improve the quality of your audience. You will be able to re-submit your application to participate in the Yandex Advertising Network no earlier than a month after rejection. Available options for placing ads are described in Ads in videos.